QI am 9 years old and I live in Bethesda, MD. I love mice! I really want one. Once I saw some mice at my local pet store; they looked so cute, and I wanted one myself. Soon after, I found out my friends wanted a mouse too. Ever since December I’ve been begging my parents for the answer to be yes. My dad says it’s fine, but my mom is still thinking about how the mouse is going to smell. If you know anything good about mice smell, please send a note back to me about that. Also, I was wondering if you know any places in (or close) to Maryland. AYou will be happy to know the female mice do not smell—it is the males that have the mousey smell. The only way females would smell is if they are living in a dirty cage. It is important to keep the cage clean. You will need to get at least two females—three is better— because they are social animals and don’t like living alone. Males don’t get along and have to live by themselves. 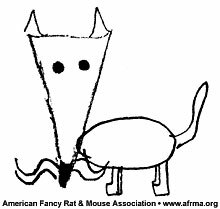 You can go to our web site and learn more about mice, the type and size of cage needed, the proper bedding and food, and other interesting facts about them. It is best to get the mice from a breeder, not the pet store. They can help you pick out just the right pets for you and answer all your questions. Try contacting the East Coast Mouse Association [club defunct, site gone 3-22-16]. Learn as much as you can about mice before you get them so you will know what to do. Good luck!